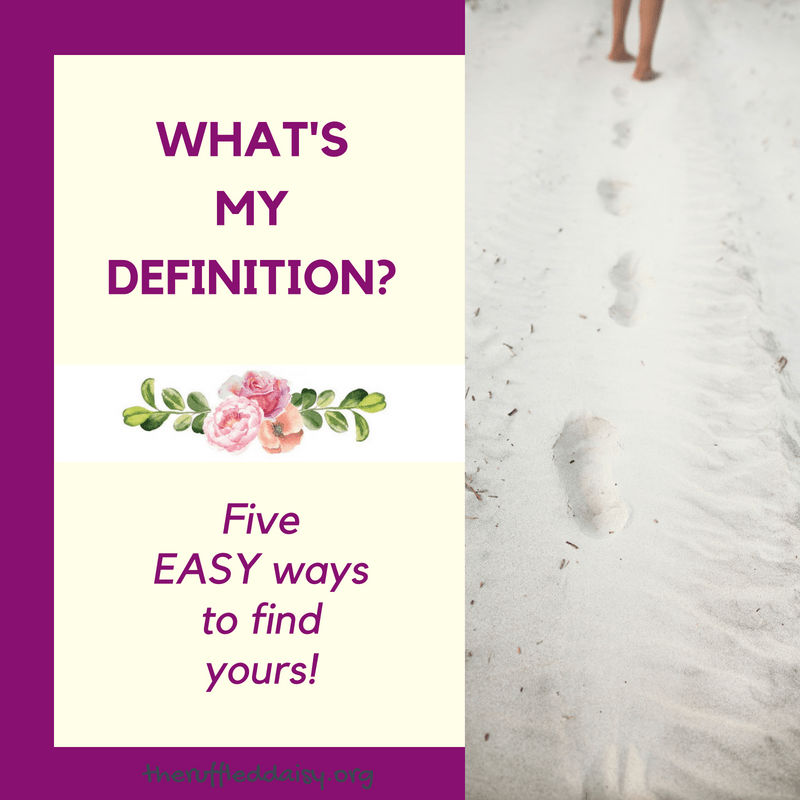 What’s My Definition – Five Ways to Find Yours! 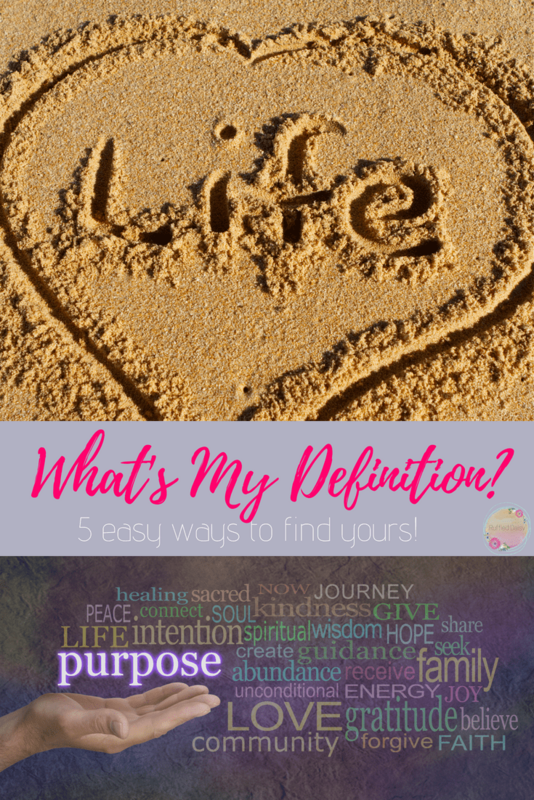 At some point in everyone’s life, we all ask the question – what’s my definition? Life circumstances “shape” who we are but they don’t necessarily “define” who we are. SHAPE means to influence the development of something or to help something become what it is. DEFINE means to state the “precise” meaning of. It’s time for your loved ones to plan your funeral. You’re gone. There will be many stories about the life that shaped who you were. Those stories are simply that – they shaped who you were as a person. What defines you (your definition) is something so much greater though! The definition itself says the “precise” meaning. In it’s definition “precise” means clearly expressed. Look again…at the end of this life do you want to look down and say – this is the life that shaped me. Take it or leave it. These are the circumstances that I overcame and these are the circumstances that overcame me. Do you want to look down and say, no matter what life threw my way and what circumstances I was faced with, this is the definition of who I was! Are you deciding who you are or are you letting your circumstances decide that? I know firsthand it’s so easy to let circumstances dictate how you live your life. It’s easier that way. Why can’t we just live our life and deal with what’s thrown our way and move on? Why does it always have to be so complicated? Well let me tell you – no one EVER said life was simple! Almost everywhere you go you will hear people say how “hard” life is. What’s shaped me? Lots of things! Good and bad. I grew up without my real dad. My mom sometimes struggled as a single mother to give my brother and I anything that we wanted. Dancing brought me many years of happiness. I became a teenage mother at the young age of 18. I lost all my childhood friendships due to my selfishness. I married my high school boyfriend only to be divorced less than two years later. I had a second child which I lost to SIDS. I struggled being a single mom. I lost a grandfather who was very near and dear to my heart. My mother fought breast cancer (AND WON). I’ve had financial problems that have made Mt. Everest seem like an ant hill. I’ve married my best friend. I’ve been blessed with FOUR beautiful children. I tragically lost a niece who was like a daughter to me. I’ve grown in Christ and failed him again. I’ve lost MANY loving relationships that may be unrepairable. I’ve made friends who will be there til the end of time. The list truly could go on and on. I could list a million bad circumstances and a million good. Is that who I am though? Am I the grief that comes with all the obstacles that I’ve encountered? Sometimes it sure feels that way! Am I the reason for some of the obstacles? SURE!! BETH: at peace with herself; one who embodied a servant’s heart; a joyful person; a loving and nurturing mother and friend; loyal, faithful and trustworthy; generous and dignified. That’s a tall order that I am holding myself to and sometimes it’s scary! I know there are going to be days when my husband leaves the toilet seat up for the umpteenth time and I’m not going to want to be loving. There will be nights when I’m cleaning up puke from yet another sick kid and I’m not going to want to have a servant’s heart. Or the times when the world is falling around me and it’s hard to stay faithful. It is my definition though and what I want my life defined as. So what is your definition? Here are 5 EASY STEPS to begin to define yours. 1. Stop living by all the rules! The only rule in life is that there are no rules. Stop playing by the rules that others set on you! This is YOUR life, not theirs! 2. Step out of your comfort zone! Your comfort zone is the place that you live without fear. Fear is what helps define you and grow you. No matter how big or small, once your step out of your comfort zone, you will begin to learn more about who you are and the definition of who you are. 3. Find your joy! When you know what truly makes you happy and joyful in life, then you will find a sense of purpose to your life. If you don’t have pure joy about life – FIND IT! 4. Listen to your heart! Every time you make a choice, your intuition is there to help you. It’s the feeling in your gut when you are doing something that doesn’t align with what you believe in. 5. Appreciate the little moments! Don’t let the fast paced working keep you from living in the moment! When you slow down to truly experience where you are, you gain definition of yourself! Finding you definition is not a difficult thing – you just have to “listen” and be “intentional” about the life you live and the people that you allow into it! Ask yourself, “What’s My Definition?” If you can’t honestly and quickly answer that question, then start using these five steps TODAY! It’s so easy to let the little moments pass. Just living for now and not yesterday or tomorrow helps so much! I appreciate your honesty. It’s so true that we can either let life happen to us or take on life! I really enjoyed this post. It gave me a lot to ponder. Time to start defining myself! Listening to intuition is such an important part of finding happiness! My family has been taking a lot of unconventional routes lately which at times has been difficult for me (I struggle with being a people pleaser). I love your tips for defining yourself, especially finding joy! I have known who I am for years now, but like all things in life it evolves over time. In the past 18 months or so I have struggled when dealing with bouts of depression. What a great exercise. I love this! This is a great post! I love all these tips but I really like the ‘enjoy the little things’. Sometimes life goes by so fast you have to slow it down and enjoy the small things.